Caveolae are plasma membrane invaginations formed by proteins called caveolins. Of the three caveolin isoforms, the most studied one through years has been caveolin-1 (cav-1), which has an important role in cell signaling, and its gene, CAV-1, is part of the family of tumor suppressor genes. As its role depends on the context, the participation and function of cav-1 in tumors is complex and remains controversial. Cav-1 interacts with a series of receptors and molecules that regulate the initial steps of cellular transformation to malignity. It also participates in the cell cycle, angiogenesis, extracellular matrix remodeling, cell proliferation, among other processes. The study of this molecule is important due to its function as a biomarker associated to the diagnosis, prognosis and therapeutic target in pathological processes. Caveolin-1 (Cav-1) is a plasma membrane protein that has a fundamental role in the formation of caveolae and acts as a connective protein that organizes the macromolecular complexes on the cell surface which participate in intracellular signaling. Cav-1 interacts with various signaling proteins and growth factors, intervening in various physiological and pathological processes. This work focuses on the collection of information in relation to the expression of this protein in different biological processes. A computer search of the literature in Spanish and English was conducted in Pubmed, SciELO, Science Direct and Timbó databases for the 2005-2016 period, using keywords such as: caveolin review, caveolin-1, cell cycle modulation, angiogenesis, matrix remodeling. Fifty-five full-text papers available related to medicine were selected to guide this literature review. TUMOR SUPPRESSION: What is it? Tumor suppressor genes are the ones that protect the cell from abandoning its normal function and taking the carcinogenesis pathways. After their mutation, which causes function loss or reduction, cells can progress to a malignant tumor in combination with other genetic and metabolic changes. Tumor suppressor genes, like oncogenes, have diverse functions in the regulation of cell growth,cell differentiationand programmed cell death (apoptosis)1. Both the activation of oncogenes and the inactivation of tumor suppressor genes are critical steps in tumor initiation and progression. Over time, the damage accumulated in several genes is responsible for changes, characteristics of carcinomatous cells such as the increase in their ability to proliferate, to invade other tissues and to generatemetastasis 1-2. Tumor suppressor proteins encoded by this genes can have a repressive effect on the regulation of cell proliferation or survival of tumor cells3. CELL SIGNALLING: What is it? Cell signaling molecules are part of a complex cellular communication system that governs basic cellular activities and the coordination of their actions. The ability to perceive and respond correctly to the immediate microenvironment is the basis for development, tissue repair, immunity and homeostasis. Errors in the processing of information cause different pathologies, including tumors. If we understand cell signaling, different diseases can be addressed therapeutically more efficiently. CAVEOLAE AND CAVEOLINS: What are they? Caveolae are 50-100-nm invaginations located in the plasma membrane, enriched in cholesterol and sphingolipids. Each caveola is formed by about 100-200 integral membrane proteins called caveolins4. The three caveolin isoforms1-3 are encoded by different genes, but their structures are very similar. Their structure consist of N- and C- terminal cytosolic domains, an oligomerization domain, including a Caveolin scaffolding domain, responsible for dimerization and interaction with signaling partners (see figure 1)4. Cav-1 presents two isoforms: “alpha” with 178 24 k Da amino acids and “beta” with 148 21 k Da amino acids5. Cav-1 and Cav-2 are co-expressed in adipocytes, fibroblasts and endothelial cells, while Caveolin 3 appears mainly in striated muscle tissues6. Their activity is highly dependent on the cellular context in which they are found, them being positive and negative regulators of cell signaling both inside and outside the caveola. This set of proteins and lipids accumulated in micro membrane domains can communicate a rapid, specific and amplified signal cascade, cell proliferation, apoptosis and migration7. Fig. 1 Caveolae structure: when cav is inserted in the lipid layers of the cell membrane, invaginations are formed, leading to the three-dimensional structure that makes up the caveolae. Of these three caveolin proteins, the most studied one through years has been cav-1, which has an important role in cell signaling, and its gene, CAV-1, is part of the family of tumor suppressor genes. Due to its versatile functions, this protein is being researched as a therapeutic and diagnostic target to understand cancer. The discovery of cav-1 as the first molecular biomarker of caveolae has allowed biochemical, biological and genetic advances with results that have significantly contributed to understanding these structures. At the cellular level, various cellular components containing cav-1 have been determined7, among which we include: cytoplasmic membrane, Golgi apparatus, mitochondria8, endoplasmic reticulum, membrane vesicles9 and nucleus10 (Table 1). A cav-1 deficiency at the mitochondrial level triggers a series of disorders including lipid dystrophy, cancer, diabetes, muscular dystrophy, heart disease and pulmonary fibrosis7. Some studies suggest that the role of cav-1 as a cholesterol transporter and homeostasis regulator would affect mitochondrial function. In the absence of cav-1, cholesterol would accumulate in the mitochondria, causing dysfunction by reducing the membrane flow, which would decrease the efficiency of energy production by the respiratory chain and increase the production of reactive oxygen species (ROS). These events involve whole cell proliferation and induce apoptosis with a limited amount of available glucose11. The activity of a large amount of signaling proteins can be altered by changing their expression at the cell surface level, and this expression can be regulated by cav-1 at the membrane level through endocytosis and exocytosis. In turn, cav-1-dependent endocytosis regulates cell attachment by internalizing integrins and components of tight junctions (occludens) and adhesion. Additionally, the mediator function of transcytosis allows for the transport of albumin-conjugated nutrients, fatty acids and hormones through the endothelium7. At the nuclear level, cav-1 acts as a genetic regulator and tumor suppressor. The CAV-1 gene that encodes the cav-1 protein is a negative regulator and tumor suppressor gene of the Ras-p42/44 MPak cascade12. This protein is responsible for integrin binding with tyrosine kinase prior to the start of the Ras-MAPK pathway to promote cell cycle progression13. Therefore, if cav-1 does not bind the integrin with the tyrosine kinase, cell signaling is affected, altering the cellular processes. The persistent suppression of cav-1 promotes the emergence of pathogenic phenotypes, and several studies associate it with advanced stages of breast cancer and prostate cancer metastasis, and a poor prognosis13. CAVEOLIN-1: Does it intervene in the regulation of the cell cycle? Cav-1 expression stops the cell cycle in the G0/G1 phase. Decreased regulation of cav-1 induces cells to withdraw from the G0/G1/S phase, reduces cell proliferation and lowers the rate of DNA replication. This occurs through the p53/p21 dependent pathway. The p53 tumor suppressor protein is an intracellular regulator involved in the modulation of cell cycle progression; its activity is increased when cav-1 is overexpressed14. Cav-1 has been shown to suppress signaling in many cell types, determining that its overexpression interferes with the vascular endothelial growth factor (VEGF) signal and with cell proliferation in the case of endothelial cells15. Cav-1 negatively controls the progression of the cell cycle, leading to more advanced cancer phases. It interacts with a number of receptor molecules that do not function specifically in the caveolae but that initially regulate the steps of cell transformation16. Cyclin D1 expression is regulated by cav-1 expression and the aberrant activation of the transducer and activator signals of STAT3 transcription-3. Cyclin D1 belongs to a family of proteins that promote the progression of cancer cells through the G1-S phases of the cell cycle. In turn, STAT3 may regulate cav-1 expression and function, both being a reciprocal network that regulates metastasis17. CAVEOLIN-1: How does it participate in angiogenesis? Angiogenesis is the process in which new vessels are formed by proliferation of vascular endothelial cells. Cav-1 is considered a negative regulator of VEGF-R (VEGF receptor), causing a decrease in angiogenesis. Cav-1, in endothelial cells, then regulates angiogenesis, vascular permeability and vascular remodeling4. VEGF regulates angiogenesis by the interaction of cell signaling pathways, and, in cancer, it is secreted by tumor cells and activates endothelial cells in a paracrine manner to initiate angiogenesis processes. Additionally, cav-1 also plays a role as a positive regulator of angiogenesis through the PI3K/Akt pathway18. Cav-1 is believed to have antiapoptotic and tumor-promoting characteristics, to stimulate metastasis and to have a prognostic value of patient survival and tumor recurrence. Conversely, other authors suggest that cav-1 can function as suppressor and pre-apoptotic protein, so its loss promotes tumor properties by changing the phenotype4. Several authors state that depending on the state of the tumor, cav-1 acts as a suppressor or an oncogene. 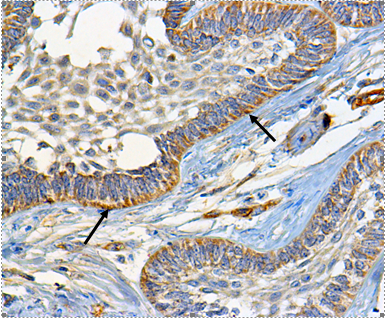 Cav-1 is variably expressed in malignant and benign neoplasms (Fig. 2). In early stages of tumor progression, cav-1 restricts its growth, while in advanced stages it promotes it19. Cav-1 intervenes in one of the mechanisms involved in the oncogenic transformation of fibroblasts. It participates in tumorigenesis through functions such as lipid transport, membrane traffic, gene regulation and signal transduction20. The existence of a mutagenic domain of cav-1 can be determined, where the primary tumor formation is due to a loss of cellular function because of cav-1 mutation, favoring the increase in the regulation of the pathways involved in cell migration, invasion and metastasis21. CAVEOLIN-1: How is it related to matrix metalloproteinases? The location of certain matrix metalloproteinases (MMPs) at the level of endothelial caveolae suggests that cav-1 plays a role in their regulation. Several studies have found that MMP-1 expression decreases after a cav-1 overexpression and vice versa22. Because both molecules participate in fibrosis, tumor progression and metastasis related processes, there have been recent publications suggesting the connection between them23. MMP-3, MMP-9 and MMP-14 have been found at the level of the caveolae, suggesting this interaction. One type of MMP called “Membrane type 1”, located at the caveolae level is negatively regulated when cav-1 causes internalization from the cell surface23. Physiologically, cav-1 controls cell motility by interfering with the cytoskeleton and by modulating the interaction with the extracellular matrix, therefore, it is involved in its remodeling by promoting its interaction with the MMPs22. Cav-1 can affect cell adhesion when modulating E-cadherin, which is the major component of intercellular junctions, maintaining a cell-cell contact and reducing the possibility of metastasis24. The loss of E-cadherin is a prerequisite for cell migration and the development of an invasive and metastatic carcinogenic phenotype. Somehow, cav-1 overexpression has been associated with abnormal expression of at least one of the forms of E-cadherin and multiple intercellular receptors24. Previous studies have linked cav-1 with the epidermal growth factor (EGF) and its EGFR receptor. Although cav-1 seems to reduce the signal transduction, its phosphorylated form has been associated with cell migration, inducing EGF and programmed cell death16. Cav-1 participates in several normal biological processes, such as angiogenesis, and its alteration is reflected in various diseases, such as oncogenesis and tumor progression. The study of this molecule is important given its usefulness as a biomarker associated with diagnosis, prognosis and possible therapeutic target in pathological processes. This forces us to continue developing research on this protein. We would like to thank Dr. Mariana Villaroel Dorrego, School of Dentistry, Universidad Central de Venezuela, and the MSc students of the same university, Mayerlimg Delgado and Rossana Gomez, for their collaboration in the review.